Quantum Construction have recently handed over two new BREEAM Excellent certified speculative warehouse units in Crawley for Wrenbridge Land. Making full use of the site boundaries and making allowance for a live sewer we used a ground remediation strategy to improve the site before construction of a 53,000 ft2 steel framed building. The incorporation of a subdividing wall and separate yards with independent access has allowed the building to be marketed as two properties whilst maintaining the ability for it to be used as one unit in the future. Our thanks goes out to all involved for delivery of the project. Quantum have commenced work on site to construct a single storey children’s day nursery with a second floor office area. The building will be the first new build for Little Ripley Day Nurseries. The building will incorporate a number of separate rooms to facilitate different age groups in the nursery, all with underfloor heating and welfare facilities. Externally, new hardstanding area, along with drainage and landscaping will be completed to facilitate the access and parking requirements for the nursery. The proposed building is in a tight location with narrow access. The site is surrounded by residential properties and adjacent to a doctor’s surgery, so works will need to be carried out in a considered manner. In addition the building is sited close to the boundary, so some aspects of the work will require adapted site activities. Quantum’s Mental Health First Aiders have been promoting the positive impact exercise can have by organising ‘March for March’. Staff have been encouraged to walk (or run if they want!) a mile a day throughout March to help promote good mental wellbeing through exercise. Staff members noticed a positive influence on their mental health with some continuing with the challenge beyond March. Well done to all those that took part! We are delighted to announce several new appointments of Directors as part of our long-term business strategy. These new appointments will assist in the continued measured growth of the business whilst ensuring we continue to provide the high level of commitment our clients have grown to expect. Jonathan Price has been with the company almost from day one, starting as a Senior Quantity Surveyor and, more recently, Managing Estimator for the company. Mark Tynan has made his way to Quantum via Thomas Vale, where he obtained his bachelor’s degree, before joining our team. Since commencing as one of our Quantity Surveyors, Mark progressed to the Managing QS role early last year. Rebecca Keatley who joined the company over six years ago as System Coordinator, successfully steered us through accreditations for ISO 9001, ISO 14001 and ISO 45001, and assumed the role of Office Manager some eighteen months ago. We know that all are well qualified, capable and sufficiently experienced to strengthen the existing Board of Directors and look forward to them supporting the company’s activities catering for both Client and Employee’s needs well into the future. Together, the new board will deliver the growth strategy and oversee the future expansion planned for the business. We look forward to what 2019 has in store for us and to introducing you all to our new team soon! Staff in the office had a great day celebrating Red Nose Day and raising money for Comic Relief. We raised a grand total of £112 by dressing in red, having a red cake sale and playing ‘guess the number of sweets in a jar’ – well done to Heather for guessing only one away from the winning number! Thanks to all that contributed to such a good cause. Quantum are pleased to begin working with Meggitt to extend their existing facilities in the Castle Bromwich area of Birmingham. Work will begin later this month to construct an extension onto an existing test house facility, in addition to constructing a new building adjacent, as a storage unit. The new extension will enable Meggitt to incorporate modernised systems into their testing facility. The construction will therefore include various specialised elements to accommodate unique machinery as well as elements incorporated to improve noise attenuation. The existing unit, used to test aircraft tyres, will continue to operate throughout the construction period, so works will be carried out in close relations with the client to enable both to work simultaneously in a safer and productive manner. The site is restricted by overhead power cables in close proximity to the proposed new storage building, requiring necessary precautions in construction processes. Given the history of the locality, during the WW2 period, there is the additional hazard due to the potential presence of unexploded ordnance which will require a preconstruction UXO survey. Externally, new additional car parking, hardstanding area and supporting infrastructure will be provided. Well done to our Office Manager, Becky, for completing RED January. R.E.D (Run Every Day) January is a community initiative partnered with Mind. The campaign encourages people to support their mental health by doing something active on a daily basis. Becky braved the cold winter weather and ran at least one mile after work every day throughout January. R.E.D’s mission is to raise awareness of mental health problems, such as depression, by promoting the positive impact that exercise can have on happiness and well-being. 04.02.19 - Quantum appoint a new Managing Director to lead the Company into a vibrant future…. We are pleased to announce that one of our existing Directors, Matthew Gallagher, has agreed to take on the role of Managing Director and lead Quantum Construction into the next phase of the Company’s development. Matthew is well placed to handle opportunities and challenges of the business whilst in the fortunate position of being able to rely upon assistance from the original Directors along with support of his colleague Stephen Harrison, who continues to lead the Construction department. With full responsibility for the leadership and development of Quantum’s business, Matthew will play a key role in meeting the company’s growth goals and will continue to be instrumental in building on the firm’s outstanding reputation with professionals and clients. Having many years of experience in the Construction Industry, Matthew has worked through the disciplines of Construction Management and Quantity Surveying, as well as taking on the duties of a Director of the business for the past three years. The works to the building envelope will include full over cladding of walls, replacement roof coverings, installation of clerestory windows, replacement of existing personnel and vehicular doors. Internally, new office provision and refurbishment of existing office facilities will be provided along with general remedial works. Externally, reconfiguration of vehicular hardstandings, carpark areas will be constructed upon completion of reshaping existing contoured landscaped areas. The roof is now complete on this 12 metre high commercial unit, the concrete floor has been laid and our team are now busy undertaking the internal works. We would like to thank all our Clients for the work awarded to Quantum over the past year and to all our staff and supply chain colleagues, thank you for your continued hard work and support over the year. To you all, our Directors wish you a Merry Christmas, a healthy and prosperous New Year. It’s this time of year when all the Quantum staff dress up in their best (silliest) Christmas Jumpers, with donations being put towards our charity of the year, the Multiple Sclerosis Trust. Skydome Coventry is about to undergo a facelift and Quantum are the ones to do it! Cogent Building Consultancy have awarded the contract to refurbish the existing façade, install new signage amongst other measures to smarten up this well-known retail landmark in Coventry. Quantum are pleased to be continuing a long history of working with the client and their professional team. Works are due to start in the New Year, after the Christmas rush and finish before the Easter holidays. News items from the last year have been added to our new page on LinkedIn to provide an insight into our business. Quantum are now looking forward to filling this page with interesting content and will be keeping you up to date with all our news and construction progress. So keep an eye out for our upcoming posts. Along with other West Midlands professionals, Quantum sponsored a table at the Marie Curie charity event West Midlands Brain Game at the International Convention Centre in Birmingham. The annual event was hosted by comedian Mark Dolan and raised a record-breaking £186,500 for the Marie Curie hospice in Solihull. The black tie fundraiser involved a celebrity hosted quiz and a live auction. A fun night was had by all and it was a pleasure to play a part in raising such a significant amount which will go directly towards supporting people with terminal illness. To support and continually improve the emphasis on mental health awareness Matthew and Becky have completed the Mental Health First Aid course. Following a visit from CCS we are pleased with the report which achieved Certificate of Compliance, well done to Holly French (Site Manager) and Anthony Wilkins (Contracts Manager) and the rest of the team for their commitment to company and CCS practices. 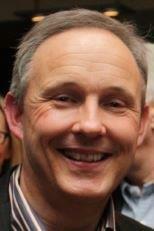 Quantum Construction are proud to announce that Stephen Harrison has been promoted to Director. Having been with the company since its formation Stephen has proven to be a valuable asset, and the management team look forward to him assisting Quantum with their continued success. We respect and value the privacy of all of our employees, suppliers, subcontractors and customers and will only collect and use personal data in ways that are consistent with our obligations and your rights under the law. Should you wish to view the policy please contact the office. The project at Crompton Way, Manor Royal, Crawley is to construct two industrial units, complete with offices, self-contained yards and parking areas. The two semi-detached units, comprising a total of circa 4000m2, are to be built to a high specification and are to achieve a BREEAM rating of Excellent. Picture opposite is an artists impression. Quantum have completed the Cat A&B works at Unit 1, Mucklow Park, Innovation Drive, i54 Wolverhampton. The works were undertaken with oversight by Employers Agent, Fusion Building Consultancy Ltd and incorporated the Tenant fit out works under the Cat B element of the works. The circa £5.5m project encompassed construction of test cells, craneage systems plus M&E installation and other bespoke requirements of the incoming tenant. 17.04.18 - Quantum At Large! A significant number of staff and ‘significant halves’ enjoyed the delights of Dublin on our recent trip to the Emerald Isle. Over the long weekend much sight-seeing and consumption of many pints of Guinness were consumed! The occasional rain shower didn’t manage to dampen the spirits and a good time was had by all. Amazingly no-one was lost over the weekend and all arrived home safely! Quantum are pleased to have achieved successful completion of the reconstruction and refurbishment of an iconic three storey office block adjacent to Birmingham International Airport. The project includes the creation of a revised entrance canopy, enlarged reception area, full refurbishment of the mechanical and electrical installation, plus new shower facilities for the incoming tenants. Following a visit from CCS we are pleased with the report which achieved Performance Beyond Compliance, well done to David Marsh (Site Manager) and Tim Jarvis (Contracts Manager) and the rest of the team for their commitment to company and CCS practices. As part of our ongoing commitment to Health and Safety and our ISO 14001 accreditation, one of our Directors, Matt, has recently undertaken the Managing Safely course. The course is approved by the Institute of Occupational Safety and Health (IOSH) and will complement the vast Health and Safety knowledge already within the company. Well done to Matt! The contract for a new build of 18 No apartments has been awarded to Quantum under the guidance of MDA Consulting Ltd, acting as Employer’s Agent. Of traditional construction, the building works are impacted by the tight site constraints and close proximity of residential properties close to Coventry city centre. 22.01.18 - Quantum are planning a long weekend in Dublin! As a thank you to all the staff, this year, the Board of Directors are arranging to take staff members and their other significant halves to enjoy the delights of Dublin. Unfortunately, whilst the weather cannot be guaranteed as good as the weather enjoyed in Barcelona last year, there will be plenty of bars to drown out the sound of the rain! Quantum are pleased to have successfully completed works to construct a new staging area for an automated conveyor system. The mezzanine floor of 3838m2 (12,560ft2) was constructed within the existing UPS Tamworth warehouse whilst permitting continued use of the building by the client. Only by diligently managing the interface, between the client and construction activities, has resulted in completion of the works ahead of programme despite the many challenges generated throughout the build programme. Following a visit from CCS we are pleased with the report which achieved Performance Beyond Compliance, well done to Trevor & Holly (Site Manager’s) and Richard Turley-Salmons (Contracts Manager) and the rest of the team for their commitment to company and CCS practices. We would like to thank all our clients and agents for their support over the past year. Not forgetting all QCL staff and subcontractors for their hard work and assistance in getting contracts complete to programme. 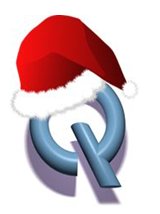 We would also like to thank the subcontractors and suppliers for all the gifts, these have been greatly received and distributed around the Quantum staff. We wish everyone a Happy New Year and Prosperous 2018. For the second year, Quantum took part in the Save the Children’s Christmas Jumper Day, flaunting their favourite Christmas sweaters to raise money. Save the Children is a charity that helps tackle child poverty globally by helping to prevent disease and malnutrition whilst their Child Protection Teams help to safeguard children from abuse and neglect. Thanks to everyone at Quantum who raised a great £110 to support this work! Jones Lang LaSalle are project managers for the project which comprises of refurbishing existing buildings, including over-cladding of roofs and provision of a new hardstanding for HGVs. The contract is being undertaken whilst the tenant is in occupation and whilst they are maintaining full use of existing external yard areas. A 24,384m² (80,000ft²) extension to an existing Avon Cosmetics warehouse and office facility in Corby, Northamptonshire is another successful build for Quantum. Works were undertaken, with access through client areas, without disturbance to their daily operations. Close liaison between the Quantum site manager and the client’s representative ensured that any difficulties were ironed out at an early stage to avoid adversely impacting on either party. The design includes a large warehouse area, double storey offices and associated welfare facilities. Externally, works to extend the existing access road along with associated landscaping and drainage were completed to allow entry to the new facility. Following a visit from CCS we are pleased with the report which achieved Performance Beyond Compliance, well done to Ashley Critchlow (Site Manager) and Stephen Harrison (Contracts Manager) and the rest of the team for their commitment to company & CCS practices. Two ladies from our admin team, Laura and Sally, organised ‘Wear it Pink’ day at Quantum. The charity ‘Breast Cancer Now’ hold an annual fundraising event, ‘Wear It Pink’ during the month of October, known as National Breast Cancer Awareness Month. The charity encourage communities to raise funds for life-saving research, so Quantum decided to get involved. The admin ladies decorated the office in pink balloons, banners and posters to promote the event. They also arranged a cake stall, a raffle and games whereby gifts were donated by staff and clients. Thanks to everyone who supported the company and to Avon Cosmetics for providing some of the prizes. Quantum raised £210.00 for the Breast Cancer Now charity. The Quantum ladies decided they wanted to do a mud run, so with the support of their partners, took part in the Wild Warrior in Ashbourne and a thoroughly good time was had by all. The smiles were definitely a lot bigger at the finish line after this fantastic achievement! Work has now started on a new storage, repair and manufacturer depot in Measham, Leicestershire. The design of the building includes a large workshop area and maintenance facilities along with ancillary offices & training rooms at ground and mezzanine floor levels. Good luck to Alfie our Trainee Quantity Surveyor, who is starting his HNC in Construction & the Built Environment this month. Alfie joined Quantum in January to begin his career in construction, when he was brand new to the industry. We are closely working with Alfie to progress his career in Quantity Surveying. Following a visit from CCS we are pleased with the report which achieved Certificate of Compliance, well done to Navdeep Sehra (Site Manager) and Stephen Harrison (Contracts Manager) and the rest of the team for their commitment to company and CCS practices. Quantum are pleased to have successfully completed the conversion of an old vehicle workshop and associated plant rooms into a new office complex, situated within the British Motor Museum. The project was undertaken in a live museum environment, so working within restraints to minimise disruption to visitors and employees was integral to the management of this project. Following a visit from CCS we are pleased with the report which achieved Performance Beyond Compliance, well done to Tony Phillips (Site Manager) and Stephen Harrison (Contracts Manager) and the rest of the team for their commitment to company and CCS practices. United Parcel Service (UPS) is a highly successful American multinational package delivery company who have awarded Quantum the contract to increase the capability of their Tamworth depot. The design and build contract includes for installation of a new mezzanine floor of 3828m² (12,560ft²) within the present distribution centre. Of paramount importance is the maintenance of operations, within the very busy staging area, throughout the period of the works. A new automated conveyor system is being designed to fit on the mezzanine once all construction works are completed along with new lighting, sprinkler system and the like. Penso Consulting are creating a new automated lightweight composite assembly plant to provide a solution for the increased demand for composites. The new facility will also provide the space for Penso Consulting to develop its capabilities ready for the transition to zero emission and autonomous vehicles. The construction of a new cladded steel portal frame building of 2,800m² (9,186ft²), will extend from the clients existing facility in Coventry. The building design includes mezzanine floors and welfare facilities, whilst externally, works comprise of reconfiguration and landscaping of the site to allow additional parking, drainage and improved access. Following a visit from CCS we are pleased with the report which achieved Certificate of Compliance, well done to Martin Hill (Site Manager) and Tim Jarvis (Contracts Manager) and the rest of the team for their commitment to company and CCS practices. Following a visit from CCS we are pleased with the report which achieved Performance Beyond Compliance, well done to Abdul Boliya (Site Manager) and Dave Breese (Contracts Manager) and the rest of the team for their commitment to site practices. Work has started in Gaydon, Warwickshire to convert an old vehicle workshop and associated plant rooms into an office complex. The new design consists of an open plan office area with dedicated management offices around the perimeter. In addition to incorporating new meeting rooms, welfare facilities and a new entrance lobby, the client was keen to trial various aspects of the design which is then to be rolled out within other areas of their business. The new facilities for JCB at Kevin Quarry in Staffordshire will comprise of two new buildings to enable potential JCB customers to see machines working in the Quarry. Quantum will be constructing both a Demonstration building and a grandstand building as part of the project. The Demonstration building incorporates a demonstration showroom, cinema room, meeting rooms and maintenance bays with overhead crane. The grandstand building will be located within the quarry bowl, capable of seating 310 guests and includes a frameless glazing systems to 3 sides of the viewing area, along with an associated hospitality area and amenities space. Quantum have been fortunate to win yet another contract with A&J Mucklow (Investments) Ltd, for refurbishment of a multi-million pound investment property near to Birmingham International Airport. Works required to upgrade the three-storey office block include creation of a new entrance canopy, enlarged reception area, new shower block and complete refurbishment of the office block including a fully upgraded mechanical and electrical installation. Quantum are pleased to have secured a contract for refurbishment of Lawton Tubes offices in Coventry, including over cladding of both front and side elevations and resurfacing works. The project includes external works to the existing building. These works complement the recently completed new facility which has enabled Lawton Tubes to vacate the existing premises to permit these works to be undertaken. Quantum have just returned from their trip to Barcelona. It was a great opportunity for everyone to socially spend a bit of time together without the stresses of work or phones! The team stayed in a hotel together in the Las Ramblas area of the city and got together for a traditional Spanish tapas meal at one of the local restaurants. Staff explored the city, seen the sights and a good time was had by all. We have recently secured the contract to construct a new 45,000 sqft manufacturing facility in Wolverhampton. Construction will commence in May and incorporate both the Cat A works for A&J Mucklow and Cat B works for the incoming tenant, Tentec within the contract period. The steel framed construction will incorporate testing facilities, mezzanines and cranes for the incoming tenant along with a full office fit out, all to a BREEAM Very Good Standard. As some may know our Small Works department was started up and run by a founding member of Quantum’s staff, Steve Simmonds. Following Steve’s suggestion, that an independent Small Works department would benefit the company during the recession, the Directors backed Steve to set up and run the department. Utilising skilled trade managers Steve took on smaller projects to offer a different dynamic to our main services. After running the department for 6 years Steve has decided to establish his own company with some of his current team. As some members of Quantum have been working with Steve and his team in excess of 25 years it sad to see them leave however it is also an exciting prospect for Steve and the team for which we wish them the best of luck. As Steve was the core of Small Works we have taken the decision to close that section of the business and focus on the main business which continues to grow in strength. We continue to offer our clients the range of support that we have always prided ourselves upon however focus will be on a full management approach to contracts in lieu of direct labour. I hope that you will take the opportunity to wish the best of luck to Steve and his team in their new endeavour. Should any clients want to meet to discuss our ongoing services we would welcome your contact. On the 1st April, Quantum will be boarding a plane to Barcelona early in the morning for a well deserved long weekend together! Whilst sites will still be operational the main office will be closed on the Monday (3rd April) while we are hopefully enjoying some sun. If the weather holds out we should have some good photos to share on our return. Further to the successful construction of retail pods on the site last year Quantum have been appointed by GVA to strip out 25,000 sqft of former BHS store in preparation for new tenants. Along with splitting the unit into two Quantum will also carry out enabling works in one unit in preparation for a new Aldi store. We are looking forward to another successful project on the park. Following our successful tender bid we have now been awarded the contract for a new 22,000 sqft warehouse and office development on Leaford Road, in Birmingham. Situated adjacent to Intec Microsystems’ current offices and warehouse the new building will offer needed warehouse and office space for the ever growing business. Breaking ground in April, we are looking forward to working closely with the client to deliver the project. Unfortunately we are currently experiencing some technical problems with our new mobile phone contract. Apologies for the inconvenience we are being assured that the problem should be resolved swiftly. Quantum recently secured the Design and Build contract to construct a 7 storey student accommodation block in the heart of the redevelopment of Bolton. Providing 140 rooms alongside communal areas ground floor commercial space the building should compliment the various projects being undertaken in the area whilst providing quality accommodation for the students. New job positions are now being advertised through our website, just click on the Jobs tab on the left hand side of the page to find out the current vacancies. Following previous successful contracts at Kingsway Retail Park, Derby, over recent years, we have recently completed the fourth phase of works to revive, refresh and expand the Retail Park. Phase 4 consisted of extending an existing row of retail units to create 7225 sq ft (670 sq m) of retail space along with refurbishment of the front façade of the adjacent live unit. Further to the successful completion we are hopeful that a further phase of works will be following on soon. Quantum Construction are holding the annual Autumn Reception in Birmingham this year, and look forward to catching up with colleagues and acquaintances. For more information about Quantum’s 2016 Autumn Reception, please call Becky on 01827 65544. 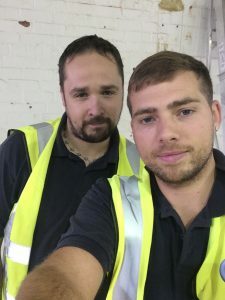 First aid training came into use for Quantum Small Works Site Managers, Jonathan Hansford and Darren Jones, earlier this month when a member of staff from a neighbouring building had a diabetic seizure whilst running near their site. Jonathan and Darren were a credit to the company as they worked together to keep the casualty stable and airway clear whilst awaiting an emergency response team to take the casualty to hospital. This is a great example of how work place training can help the wider community. Many thanks to both for their actions. The weather and the venue were both spot on and led to an enjoyable afternoon for everyone and their families. A big thanks to everyone who came down, if anyone has any good photographs they would like to share please let us know. Hopefully we will get some better group shots at the next social event, Paintball! With the New Year came news that we have now been awarded a new contract at Trafford Park, in Manchester. The Design and Build Contract is to deliver a BREEAM Very Good new circa 60,000 ft2 warehouse and 4,600 ft2 office facility complete with ancillary service yard and car parking areas. 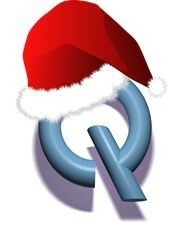 We would like to wish you all a Happy Christmas and prosperous New Year as the office closes for the holiday period. We reopen for business on 4th January 2016 and are looking forward to the upcoming projects. Following our successful Tender bid we have now been awarded a new warehouse and office development on Wallis Way in Bedford. 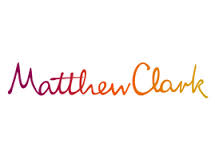 Incorporating 35,000 ft2 of warehouse and 4,000 ft2 of offices and built on a green field site, the finished project should offer a valuable new facility for Matthew Clark’s distribution operations. Along with other developments in the local area, the build aims to achieve a BREEAM very good award to reinforce the sustainable and responsible manner of construction and future use. Due to start mid January we are looking forward to breaking ground in the New Year. Quantum Construction are currently converting an eleven storey former office block situated between the newly refurbished Grand Central train station and the iconic Victoria Square. The development, part of Salmon Harvester’s £8M development, will comprise fifty-five residential apartments complete with fully refurbished communal areas and passenger lifts. Currently in the third month of construction, the project offers some unique challenges not least replacement of windows to both façades with external access limited to the rear and with the adjacent rail track to the front of the building. Having previously worked successfully with the client in refurbishment, of part of Victoria House, the contract for the Swallow House was then placed on a negotiated basis with Quantum in order to meet the required tight delivery timescales. Following the completion of our project at Wrekin Retail Park, Telford in February it has now won 3 awards for it’s sustainability qualities and energy efficiency. Works consisted of the construction of a single storey retail unit, which was divided into units for Costa Coffee and Subway. The shell building design offered a carbon neutral usage of the building through a well choreographed installation of passive air systems, underfloor heating, air source heat pumps, photovoltaic’s and rainwater harvesting. The distinctive curved design was achieved by the use of timber glue-lam beams, a curved roof and timber rain screen cladding. Curtain walling to the remaining elevations ensured that the units were supplied with plenty of daylight. Construction took place in a busy, operational retail park with a tight site footprint, whilst also incorporating alterations to the car park, landscaping and introduction of additional mains services. For more information about Quantum’s 2014 Autumn Reception, please call Becky on 01827 65544. After almost twelve months since the successful completion to install a chill store and new office facility for Culina Logistics at their Bristol depot, Quantum are preparing to arrange the pre-end of defects period meeting with the client’s project administrator. The original contract, valued at £4,800,000, was undertaken under a negotiated contract where Quantum Construction worked closely with the client team to deliver the works within the 17 week period required by the client. Although undertaken by direct contract with the client, the racking installation and associated works were accommodated within the build period to minimise the overall programme. The project required delivery of the building at predetermined chilled temperature to allow the immediate delivery of chilled food products. The specialist refrigeration system, along with the remaining mechanical and electrical installations, formed approximately £2,450,000 of the contract value. Quantum Construction are proud to announce that Mark Tynan has joined the Company as one of our Quantity Surveyors. With a solid contracting background, past projects have ranged from design and build extensions to office refurbishments and partnering contracts with local councils. We are sure Mark will prove to be a valuable asset to the team and look forward to him assisting Quantum with their continued success. The office fit out works, valued at £730,000, was won in competitive tender by Quantum Construction Limited after close competition from other contractors. UTC Aerospace will entail refurbishment of several office areas, within the occupied building, and will be delivered through a phased construction programme to accommodate live working areas. Overall works are circa 2,735m2 across two floors of the existing building and involve the isolation and removal of existing mechanical ductwork within ceiling areas and plant room. A new mechanical scheme will then be applied along with flooring repairs, new ceilings and redecoration works throughout. Quantum have been awarded a £250,000 contract to construct the JP5 Test Facility for the Moog Aircraft Group, Wolverhampton. The JCT Minor works contract will be used for the works to construct the specialist facility which is to be built alongside one of the client’s existing buildings. This year’s Autumn Reception was a great success and supported well by our guests each wearing a Quantum blue moustache in aid of Movember (raising awareness for mens health issues). To get everyone involved Quantum agreed to donate £5.00 for all those who agreed to wear one of the very tasteful moustaches. 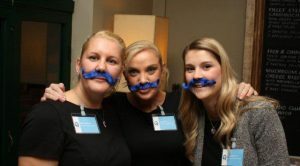 Our directors Adrian Bradley and Damian Gallagher were pleased by the tremendous support given by their guests, noting that a number of their female colleagues and guests joining in with the fun by also agreeing to wear a moustache. On behalf of all at Quantum they said they would like to thank all those who attended and joined in the fun. Pik-a-Pak, electrical distributors, have awarded Quantum a £630,000 contract to build an extension to their existing building in Ipswich. The Design & Build project is to construct a portal steel framed building, connected to the existing structure and enveloped in a composite cladding system. The ground floor footprint of 950m2 will provide a much needed addition to the premises with the space accommodating a combined series of racking and storage units. The works will be challenged by the limited site available for the building works, which are immediately parallel to a busy thoroughfare. Careful sequential planning of external activities will be required to construct the necessary drainage alterations and retaining wall complete with soft landscaping scheme. Quantum Construction is pleased to announce we will be holding our annual Autumn Reception in Birmingham again, this November. This informal evening gives building professionals a chance to catch up with colleagues, and acquaintances, in a friendly and pleasant atmosphere. For more information about Quantum’s 2013 Autumn Reception, please call Becky on 01827 65544. Therefore we would like to take this opportunity to thank everyone for all their hard work and support over the years, with special thanks to all our clients and their agents for all the opportunities they have provided. QCL have completed remedial works to three levels of the underground car park beneath the Waitrose supermarket in Brackley on behalf of the Project Facilitator Wrenbridge & client Cordea Savills. Works included concrete repairs, and the installation of block work with a membrane system to channel the incoming water into the drainage system. The complex arrangement to divert constant flow of spring water was successfully acheived to the satisfaction of all stake holders. QCL were extremely pleased to be part of the opening ceremony of the new offices of Postcode Anywhere which took place on Thursday 11th April, with Worcester City MP, Robin Walker opening the building. 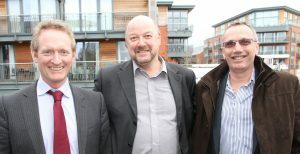 Below (l to r): Steven Jelfs of Fusion Building Consultancy Limited, Adrian Bradley and Damian Gallagher of Quantum Construction. Quantum Construction Limited have been awarded a £4m contract in Bristol with Culina Group, for converting an existing industrial building into a chill store, and constructing two storey offices and staff facilities. Works to be completed in 17 weeks. The high tech conversion of Postcode Anywhere’s new premises in Worcester has been successfully completed, with keys being passed over on programme to a very satisfied client. Guy Mucklow, CEO of Postcode Anywhere added “We selected Quantum from a short list of four contractors to fit out our new head office in Worcester. We have been delighted, as I’m sure Quantum will be too with the result, as we have ended up with an inspiring building which both of us can feel proud to be associated with”. The offices will close at 11.30am on Friday 21st December and reopen on Wednesday 2nd January 2013. Quantum Construction is pleased to announce we will be holding our annual Autumn Reception in Birmingham again, this October. For more information about Quantum’s 2012 Autumn Reception, please call Clare on 01827 65544. Quantum Construction was delighted to achieve a BREEAM rating of ‘Very Good’ for a client recently, on a major refurbishment of a twenty year old, five storey, 3730 square metre office block in the centre of Cheltenham. This follows our success in achieving a BREEAM ‘Excellent’ rating the previous year with the Land’s End development in Oakham. There were many challenges, not least to ensure minimum disturbance to the tenants in the offices. This was achieved through careful management and phasing of the works which included full refurbishment throughout with extensive replacement of windows and curtain walling to the main structure. Quantum worked with Client’s Agent; Fusion Building Consultancy, Architect; Pinnegar Hayward Design and Structural Engineer; The Sprigg Little Partnership and, on the project. Quantum Construction has recently been awarded a contract for Henderson UK Retail Warehouse Fund, for works at the Gallagher Retail Park in Waterlooville, Southampton. Unusually, the Client is reconfiguring the existing retail unit to reduce the floor plate and split the space in to two separate areas. The Client’s Agent, GVA Grimley (based in London), awarded the contract to Quantum Construction Limited after competitive tender and having previously successfully completed a similar contract in Derby. The Kingsway Retail Park, in Derby, included refurbishing the existing retail units and extensive works to external areas. Denning Male Polisano Limited were the Architects on the project and Wenham O’Brien the client’s professional Quantity Surveyor. Lands’ End, a multifunctional mail order clothing company, wished to achieve BREEAM status for the extension they required to their UK distribution centre in Oakham, Rutland. Working closely with the client Quantum Construction Limited achieved an ‘Excellent’ rating by innovative use of renewable resources and good design. Quantum Construction is delighted to be holding its Autumn Reception in Birmingham again this November. Each year the event becomes more popular; the Quantum Autumn Reception is rapidly becoming quite a tradition in the Construction Events calendar. This informal evening gives building professionals a chance to catch up with colleagues, and acquaintances, in a friendly and convivial atmosphere. As Quantum’s Director, Damian Gallagher, says “The event is always well attended by construction professionals. Each year we look forward to seeing many familiar, and some new faces, at the event”. For more information about Quantum’s 2011 Autumn Reception, please call Clare on 01827 65544. 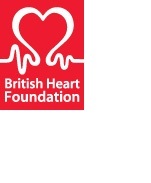 As some of you may be aware, on Sunday 19th June one of our Directors, Damian Gallagher, and one of our Surveyors, Matthew Gallagher, will be cycling from London to Brighton as part of the British Heart Foundation’s sponsored bike ride. The ride is around 54 miles, through the traffic filled streets of London and the rolling hills of Sussex. Given that it is an arduous trip for the untrained they are hoping for sponsorship to give them no excuse to waiver from the task. British Heart Foundation is a fantastic charity which helps to find new ways to fight heart disease and provides invaluable support to sufferers and their families. Please donate anything that you can afford as raising plenty of money for the charity will make the ride that bit easier! Don’t forget that gift aid helps add that little bit more tothe cause so don’t forget to fill in the details! Quantum is pleased to announce that we have been independently assessed and successfully registered on the Achilles verification scheme. The Achilles registration process is utilised by procurement professionals within the world’s largest companies and from a wide range of business groups including Utility companies and Public Sector bodies. The MARC Building carried out for National Grid in Erdington is an example of the Achilles procurement process. Quantum is pleased to announce that our site in Oakham received a CCS score of 36.5 last year, which put it in the top 10% of sites visited. As such the team were invited to attend the awards ceremony to collect their prestigious “Silver” award. Damian Gallagher, Paul Crumpler and Stephen Harrison, along with other high scoring companies, attended the event in Manchester to celebrate the construction sites which achieved outstanding results from their CCS site visits. This is great recognition of the hard work Quantum puts into all it’s sites. 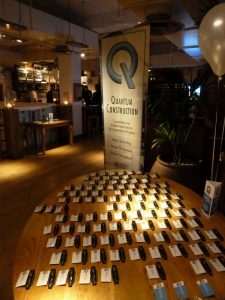 A big thank you to everyone who attended Quantum’s 7th Annual Autumn Reception, held once again at All Bar One on Thursday 18th November 2010. The evening was a tremendous success and it was good to see all of the old, and even some new, faces at the event. Hopefully you all will be able to join us again next year. The contract comprises refurbishment of a five floor office block in the heart of Cheltenham for Ignis Asset management and Stoford Developments. Confined within tight physical site constraints, the work is being undertaken whilst tenants are in residence in half of the building. We have recently been awarded the enabling works, for refurbishment of units and external works, in the Derby retail park for Henderson Retail UK. The works are presently being geared around completion of the newly refurbished Best Buy UK outlet in time for their roll out of stores over the UK. Quantum has recently completed a design and build project at the Land’s End UK facility in Oakham, extending the building to provide increased storage and handling capacity. Amongst many other elements, the 5,575 sq m (60,000 sq ft) building incorporated ‘green’ technology by the introduction of solar power, ‘grey water’ usage and high technology controls systems to help reduce the building’s carbon footprint. The building is presently awaiting BRE post contract audit to confirm BREEAM Excellent status has been achieved. Quantum Construction’s dedicated small works division has recently been created to concentrate on the smaller needs of our clients. By forming a distinct business group we have been able to create a dedicated team which will satisfy the requirement of providing comprehensive service to these clients.